After strategies have been created and a direction has been set, a company must perform well to see the desired results. 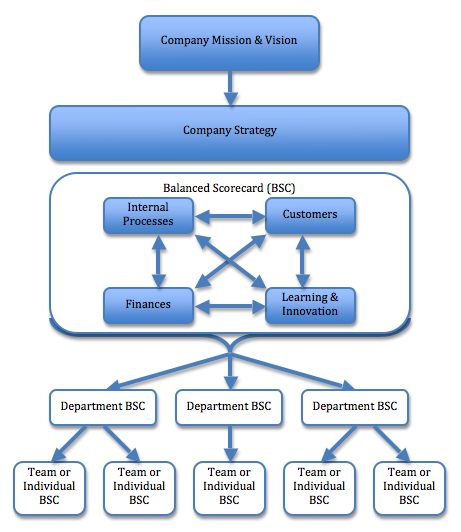 One popular way to measure strategy performance is by using a Balanced Scorecard (BSC). The BSC was popularized by Robert Kaplan and David Nortan in 1992. It is similar to a dashboard, but with a focus on company and consumer trade-offs. Stress is placed on an informing purpose rather than a controlling one. It can be thought of as a way to measure strategy because it links a company's actions to its mission and vision. The following flow shows how the BSC connects strategy to action. The BSC can be a valuable tool to any company. This being said, there are three critical ideas that companies must practice when using a balanced scorecard. First, goals must be reviewed regularly. Second, goals and measurements should not be changed unless the company mission and strategy change, or unless faulty cause and effect relationships in current goals are found. Third, the balanced scorecard is not about completing the goals, it is about continuously improving strategy performance.